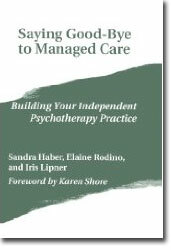 SAYING GOOD-BYE TO MANAGED CARE: Building Your Independent Psychotherapy Practice is available once again in its second printing. In the Menu on the left please click on CONSULTATION AND CONSULTING or <click here> for information regarding personal or group consultation for building your independent psychotherapy practice. Practice consultation is based on the book. You may continue to read about the book and see reviews below. The authors of this practical volume highlight easy strategies for developing, building and maintaining a successful and lucrative private pay psychotherapy practice. As successful independent practitioners, they share lessons learned from running their own practice. You will learn to: grow your practice, develop new skills, market your services and build upon your strengths. The authors share useful tips on: getting published, appearing on radio or TV, starting your own newsletter and more. President, Boulder Psychotherapists Guild, Inc.